​CLUB TAKES ON THE WORLD!!! 13 Students from Stamford & Oakham TaeKwon-Do club competed at the UITF World TaeKwon-Do championships in London over 10th – 12th July 2015. Over 800 competitors took part over the 3 day event, with teams from USA, Germany, Argentina, Ethiopia, Ireland, Malaysia, Scotland, South Africa, Norway, Australia, China, Poland, Netherlands, Hungary and many more, as well as a large squad from England. The event was attended by Grand Master Hwang, who was the founder of the UITF association, and is determined to ensure that TaeKwon-Do stays in its true form as indicated by General Choi, who was the founder of the art in 1955. Students had undertaken months, and in some instances years of training, including additional weekly 5 hour sessions with the England Squad over the past 2 months at Catmose Sports Centre, Oakham, on top of the regular club sessions in Stamford & Oakham. The achievements have completely exceeded any expectations that Senior Instructor and double World Champion, Richard Auciello had for them. Assistant Instructor from Stamford & Oakham, Jo Auciello, 37 was selected for the Veteran Ladies England team, and was honoured with the role of Captain. The team achieved huge success being crowned World Champions, with Gold in Sparring and Power Breaking, and World Silver medalist in patterns. As an individual she successfully won a silver medal in Power breaking, and bronze in individual sparring. Sam Berridge, who travels to Stamford from Bourne to train, was selected for the Ladies England team, and made Vice Captain. The team successfully won Gold in Special Technique, Silver in Patterns, and Bronze in Sparring & Power. Sam also won Gold in Individual Sparring. Instructors Richard & Jo’s daughters Jessica, 13 & Rimini, 11 kept up the family medal tally. Jessie was selected for the Junior Girls England Team and they achieved World Bronze in Sparring & Patterns. Rimini, who is age 11, does not qualify yet for a team due to her age, but has showed her huge potential by winning Individual World Silver in the cadet girls category. Alex Bland, from Greetham only turned 13 two weeks before the competition, forcing a move up to the Junior Boys section. Alex was successful in selection to the Junior Boys team, and they won Silver in Special Technique, and Bronze in Power and sparring, and he also added a bronze for the individual sparring, losing to the eventual gold medallist. Nikky Pearce competed in the Veteran Ladies coloured belt category and won Silver in sparring, and bronze in patterns. Patrick Lacey, at only 5 - one of the youngest competitors in the whole competition, had an amazing performance in the coloured belt cadets, winning Bronze in patterns, and narrowly missing out on a Gold medal winning silver as he had to pull out with 10 seconds to go. Other entrants who did not manage to bring back medals but gained valuable experience, and made new International friends were Jonathan Mills, William Gardner, Sebastian Mills, Millie Fionda, and Henry Faithfull-Ablett. The club is currently taking on new starters at both clubs; Stamford trains kids and adults, on Tuesday and Thursday evenings, and Oakham has a kids club on Saturday mornings. For more information email enquiries@tkdclasses.co.uk. Success after success fot the start of 2014! There have been a chain of events across the UK where Stamford & Oakham TaeKwon Do club have excelled and achieved success after success over the last few weeks. Members of the club travelled to Motherwell in Scotland for the GTUK Scottish Championships and brought back a hoard of medals. 14 students took the 6 hour journey to compete at the Commonwealth games arena, and returned with 16 individual medals, and 7 students were selected for the England Teams and brought back 7 trophies between them. In the individuals Black belt Rimini Auciello, 10, coloured belt Amelia Gardner, 12, and coloured belt William Gardner, 8, all achieved Gold medals in their respective categories. Liam Watkinson, Steve Marshall & Jamie Lam were all selected for the Male England Team who returned with a Gold Trophy. Jo Auciello was selected to represent the female ladies team whom too returned with Gold, and Jamie Watkinson represented the junior boys’ team, who took Silver. Jessica Auciello, 11 and Rimini Auciello, 10 were both selected for the Peewee Girls 11—12 yrs team, with Rimini being moved up an age category. They gave a tremendous performance resulting in Gold Trophy with a clear win of 12-3 in the final. A special mention must also go for the clubs “Little Taek” competitor Patrick Lacey aged 4, who despite being in only his 2nd competition brought back a Bronze and silver! The next event saw eight students from the Stamford & Oakham club attending the National Black Belt grading in Coventry on Saturday 31st May. Charlie Hill, Charley Darby, Alex Bland, Oliver Troth, Imogen Freeborough and Jamie Watkinson all successfully graded in the morning session, with Jamie Watkinson successfully achieving his 2nd Degree Black belt. The afternoon saw senior student Jamie Lam again successfully achieving the coveted 2nd Degree status in a tough grading. All younger students take part in a specifically designed test in conjunction with learning styles taken from the National Curriculum, as the club recognises that children need to be differentiated from adults. Students under 12 years have to perform a range of movements in patterns, self-defence, sparring, and a thesis -piece of course work, as well as being tested on Korean language. Juniors and adults are also required to break wood in order to pass! Congratulations to all those students who passed. At the end of June, 58 students from Stamford & Oakham were tested for their next coloured belts in front of the association’s President; Grand Master Oldham, 9th degree Black Belt, with again a 100% success rate. The Grand Master commented, "Stamford & Oakham clubs have a fantastic standard, which comes from both the top tuition of the Instructors, but also is down to the dedication of the students!" A Grade Passes were handed out to Robyn Bradley, from the Stamford club and Rory Purnell, from Oakham club having achieved a very high level of performance. William Gardner, from Bourne who trains at the Stamford club and is a keen member of the England Squad, had an exceptional grading and was rewarded with a double belt promotion. Grand Master Oldham told the youngster, “Double Promotions are handed out very rarely; this is the first one I have handed out for 9 months!” William went from Yellow belt Green Tag to Green belt Blue Tag. Mr Auciello is currently taking on new students at his clubs both in Stamford & Oakham, so whether you aspire to be the next World champion or just want to train to improve fitness or self-confidence, contact us to have a free trial. Visit our website www.tkdclasses.co.uk or call 07771 865373 for more information. LOCAL SUCCESS IN NATIONAL CHILDREN'S AWARDS SCHEME! The WINNERS and HIGHLY COMMENDED businesses and individuals for the prestigious What's On 4 2014 Junior Awards in association with Drayton Manor have just been announced - and a local TaeKwon-Do instructor is amongst them! This exciting awards programme, which is supported by babyworld.co.uk and Drayton Manor Theme Park is now in its 8th year and celebrates the best activities, classes, volunteers and venues from throughout the UK as nominated and voted for by the experts - parents and parents-to-be. 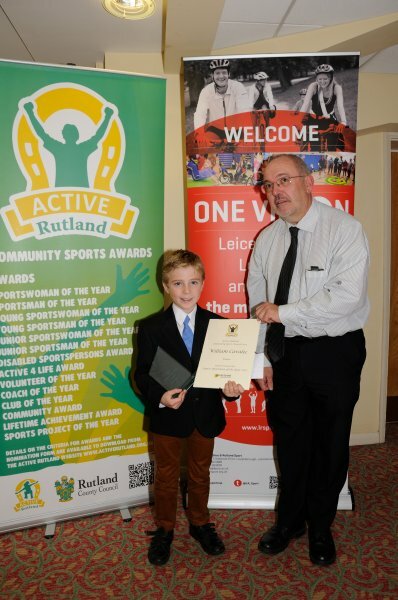 Richard Auciello from Stamford & Oakham TaeKwon Do is a winner in the in the Most Outstanding Activity Leader aged 5-12 years category which means that they are the elite in their sector in the UK as voted for by parents! Mr Auciello was presented his award by Sky TV presenter Lucy Piper. This year, the awards are bigger than ever, covering 22 different categories ranging from 'Best Pre/Post Natal Activity' to the 'Most Outstanding Community Group Volunteer for children'. Nearly 90,000 votes in total were cast from all across the UK, Ireland and Australia. Stamford & Oakham TaeKwon Do has been running under the Instruction of Mr Auciello for over 16 years, and has produced Regional, National and International Champions. Mr Auciellos focus is on each of his 100 strong students, ensuring that their individual needs are met and ensuring that the club runs with a family, friendly feel! Not every student wants to be a World Champion; some just need a bit of confidence, discipline, or improved fitness, and the Stamford & Oakham TaeKwon Do team led by Mr Auciello tailor the teaching to the different student’s needs! Having said that if a student wants to be a World Champion, as a 2 time World Champion himself, and GTUK England Squad Head Coach, Mr Auciello can call on all his experience to help. From March 12th to May 15th 2014, parents logged onto the award winning on-line directories - www.whatson4littleones.co.uk, www.whatson4schoolkids.co.uk and www.whatson4kidsparties.co.uk - to vote for their favourite clubs, groups, classes and party entertainers from all of the nominees that qualified. The Winners (and runner-up Highly Commended level) were announced on Friday 20th June 2014 at the official awards ceremony at Drayton Manor and winners will also receive prizes including Drummond Park games, prize packages from Smiggle, SnoozeShade and MummaFly and a very special prize for the 'Most Outstanding Pre-School’ from Humphrey's Corner! Every children's activity, class, volunteer and party supplier in the country had the chance to be nominated, thus ensuring the awards are a true representation of the commitment of the UK's parents and carers to recognise and reward the very best! Marilyn Bradshaw & Bev O'Sullivan from What's On 4 UK: "Even after a HUGE awards programme last year, 2014 has seen our BIGGEST and most exciting awards to date! Not only have we received a record number of votes, but the What's On 4 Junior Awards have also been running in Ireland & Australia - and were hosted LIVE in Australia on exactly the same day as the UK! It's been a very closely fought contest, all of our finalists should be very proud to be held in such high esteem by the nation's parents. Congratulations to all our winners, it was superb to see everyone enjoy the 2014 Awards Ceremony at Drayton Manor on the 20th June, which was such a fantastic celebration of the best of the UK’s children’s activity and party providers!" Stamford & Oakham TaeKwon Do are currently taking on new students. Classes are available for children aged 3 -11 years, and juniors and senior aged 12-92. For more information about the club, have a look at the clubs website www.tkdclasses.co.uk. 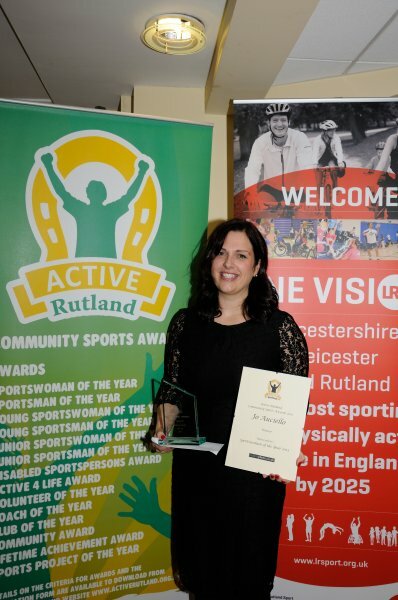 Congratulations to Stamford & Oakhams own Mrs Auciello and also William Cavalec who were successful in their categories at the 2013 Rutland Sports Awards. Club members were also part of a TaeKwon Do demo at the event which gained great applause from the crowd. William was nominated in the Young Sportman of the year category, again for his fantastic attitude to TaeKwon Do, and successes at the World, but also for his other sporting interests. William is part of the Lords program for youngsters. William trains 3 times, a week, is polite but most of all tries the very hardest he can at all times, and soaks up as much information as he can fromk his Instructors. We are very proud to say that William was also victorious in his category and was crowned Young Sportsman of the Year! Mr & Mrs Auciello, Liam Watkinson, Steve Marshall, Jessica & Rimini Auciello all took part in a demo in front of the crowd, having to go on after a interview with 2 Olympians! (No pressure then). I think it was safe to say the demo impressed the crowd - we were approached at the end by members of the audience who had videoed the whole thing to take home to show their family! In fact one lady told Mr Marshall we should take it to Vegas! 15 students from Stamford & Oakham TaeKwon Do clubs run by Mr Richard Auciello travelled to the TaeKwon Do International World Championships at the SkyDome Arena in Coventry. The competition ran over the weekend of 12th - 14th July, and saw nearly 3000 competitors from over 15 different countries join together to participate in both full and semi contact styles of TaeKwon Do. For the clubs Instructor Mr Richard Auciello, this was his first International event since he won a World Title in Rimini in 2000. He had returned to competition in June in a National championships with much success; double Gold! This competition was always going to be tough; he was giving away 19 years to some of his competitors, but despite adversity he returned victorious, winning his 2nd World Title, this time in Power Breaking. A huge cheer rang out through the GTUK spectators for the Stamford Instructor who is also the England Squad Head Coach! Richard is now preparing for the UITF World Open Games which will take place in London at the beginning of August. Sisters Amelia, 12 & Francesca Gardner, 13 from Bourne entered this as their first International event and participated in the Under 16 years Yellow belt up to 168cms category. The sisters fought through a number of rounds of sparring before meeting each other in the semi final! Amelia evened up the tally after losing at a previous competition to her sister to progress to the final, where she met a Russian girl. Amelia lost the gold by a very narrow margin despite giving up 10cms in height and 3 years in age and came away with a World Silver and Francesca a World Bronze. The sisters then went on together with another student from Rubery club to fight in a 3 person tag team event and came away with Silver medals. Claudia Lee again entered her first international competition as coloured belt, Claudia had only recently started to train with the England Squad for competitive training, and her hard work was rewarded with a World Bronze in Adult coloured belt sparring. The club had 4 students who had been selected to represent GTUK England in the International Team Event as well as the Individuals; Emily Reeson was chosen as Ladies Captain, Sam Berridge was also in the ladies team and Jo Auciello was selected for her International debut. Steve Marshall had also been selected for Male Patterns team. The ladies team were unlucky to draw one of the favourites, Argentina in the early rounds, and the Male team were unlucky to miss out by one point to the Canadian team. All the students that attended gave fantastic performances competing in the true spirit of TaeKwon Do and are now preparing for the next International in August. Oakhams Alex Bland, Marcus Francis and William Cavalec had very good patterns and sparring, and Stamfords Jonathan Mills, Jessica Auciello, Luke Toomey, Rimini Auciello and Liam Watkinson all gave brilliant performances in what was many of their first International competitions. On Sunday June 16th, students from the Stamford and Oakham clubs attended the UITF Championships in Alfreton near Derby. There was a good turnout from both clubs, with 17students between them, and the GTUK overall with 57 competitors. The day was structured similarly to the GTUK’s own tournaments, with categories divided into age groups for the peewees, the juniors, the adults and the veterans, as well as sub divisions based on the belt grades. All competitors could take part in both patterns and sparring, with several good quality displays throughout. Pee Wees also had a speed contest to see who could kick a target the fastest. Junior, adult and veteran grades were able to take part in special technique breaking and power breaking as well. The clubs students put on an impressive display, taking home 23 medals. It was tough going for many, with some of the clubs members putting in exceptional performances, including Mr Liam Watkinson winning a bronze in patterns in his first tournament since becoming a 3rd degree, and Rimini Auciello winning her first gold medal. Yet again Mr Auciello’s students showed just how high the standards are at the clubs. One of the highlights for the students of Stamford and Oakham was seeing the return of their instructor after 12 years away from the ring. The former World Champion, Mr Richard Auciello, donned his gloves and boots to put on an impressive display, taking home gold in both patterns and sparring, fighting off some tough competition along the way. It was an exciting occasion for everyone involved, and a chance to see first-hand how the England Head Coach leads by example. The level of success enjoyed by students of the clubs is testament to the quality of the coaching received courtesy of Mr Auciello. The students now have their sights set on the TI Worlds in July, hoping to be able to add even more medals to the clubs collection. Successes at the weekends TaeKwon-Do Black Belt grading are the most recent in a chain of events for Stamford & Oakham TaeKwon-Do Clubs run by Mr Richard Auciello, 6th Degree Black Belt. Six students from the Stamford & Oakham club attended the grading in Coventry on Sunday 18th May 2013, with a 100% pass rate. Leon Grant and Jo Auciello both successfully achieved their 1st Degree Black belts. Jessie Auciello, Chris Park & Imogen Freeborough all passed their interim gradings towards their 2nd Degree Black Belts, and Liam Watkinson was successfully awarded his 3rd Degree Black Belt. An early 18th birthday present for Liam, who was given the privilege of taking the test 10 days before turning 18 due to his dedication to training for the past 13 years! The younger students tested in the morning in a specifically designed test in conjunction with learning patterns taken from the National Curriculum, as the association recognises that children need to be differentiated from adults. Students under 12 years have to perform a range of movements in patterns, self-defence, sparring, and a thesis -piece of course work, as well as being tested on Korean language. Juniors and adults are also required to break wood in order to pass! Jo Auciello was awarded Best Thesis Award in the adult section, and Jessie Auciello received the award for the highest pass mark of the childrens section, but also had the highest pass for the whole day! Liam Watkinson and Jo Auciello were also commended for high pass marks. 21 medals were brought back to Stamford and Oakham. 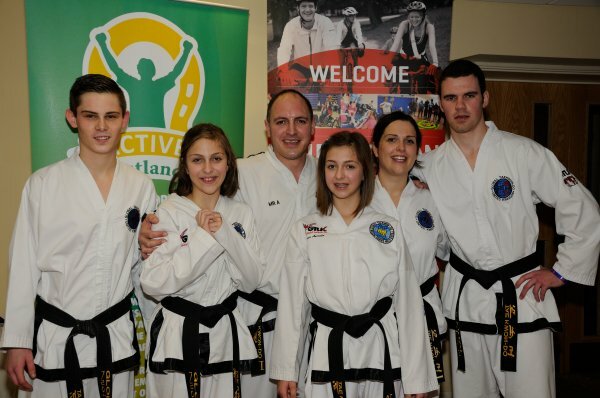 This has followed huge successes in competition and gradings for members of the club since the beginning of 2013. In February 6 students travelled to compete in a Euro Cup, with European Titles achieved by Sam Berridge - Gold in Black Belt Sparring, Liam Watkinson - Silver in Sparring, Claudia Lee - Silver in Sparring - Bronze in Patterns, Jo Auciello - Gold in Sparring, Silver in Patterns. In March at the GTUK British Champs in Coventry 21 medals were brought back to Stamford & Oakham by 18 students. The area took all the medals in the 5-7 year old coloured belt category in sparring with Oakham student William Cavalec taking Gold in both Patterns and Sparring. At the end of March 51 students from Stamford & Oakham were tested for their next belts in front of the newly promoted Grand Master Oldham from Kenilworth, with again a 100% success rate. The Grand Master commented, "Stamford & Oakham clubs have a fantastic standard, which comes from both the top tuition of the Instructors, but also is down to the dedication of the students!" April saw Stamford students who train with the England Squad, where Mr Auciello is the Head Coach, travel to a Midlands Open tournament in Derby with amazing results. 10 students competed and a total of 14 trophies returned to the Stamford club. At the end of April, students travelled to the Scottish championships, with great success! Again with a fantastic ratio for the 9 students who made the journey, a total of 13 medals were brought back, and each of the 9 Stamford students had been selected to form part of the England Teams which competed in the 4 Nations tournament. Gold in the Team event was successfully achieved by the ladies team, half of the team was made up of Stamford students; Sam Berridge, Emily Reeson and Jo Auciello. Jo Auciello having a particularly good day bringing back Triple Gold – achieving the top spot in all disciplines; Patterns, Sparring and Destruction. Now the students are training hard for upcoming International tournaments that are being held in England this year. The England Squad have taken up residence on a number of occasions at the Sports Hall at Stamford Boys School, and will also be returning on two occasions to Catmose Sports Centre Oakham in June! Mr Auciello is taking on new students at the moment at his clubs both in Stamford & Oakham, whether you want to be the next World champion or just train to improve fitness or self-confidence, contact us to have a free trail. Visit our website www.tkdclasses.co.uk or call 07771 865373 for more information. The last grading of 2012 took place on 1st December at the Stamford Dojang at Bluecoat School, where 41 students from Stamford & Oakham were assessed by Master R Oldham, 8th Degree Black Belt. Finally the part everyone was waiting for - the results and awards. everyone had spotted the new Student of the Year Cup, which was challenging the FA cup in size and grandieur! Firstly belts were handed out and Mr Auciello was very pleased to announce that every student there had been successful, and two A passes were handed out to sisters Amelia and Francesca Gardner, who had brilliant gradings again..Mr Auciello then presented Mrs Auciello with her belt and also a bouquet of flowers to thank her for all her support! Mr & Mrs Auciello had decided to slightly change the attendance award, to the Commitment and Attendance Award, so not just and this was presented to William Cavalec from Oakham. William at 7 years old, has been training for just over a year. He has started training 3 times a week in both Stamford and Oakham and has travelled to both of the British Championships and very narrowly missed out on medals at both competitions. William commitment struggles to be rivalled. Mr & Mrs Auciello then presented the Special Achievement awards; Sisters Amelia & Francesca Gardner were presented with an award each, since they started in 2012, they have shown a natural talent in TaeKwon Do, and this was proven at the British Championships where they both came away with medals, and then again at the grading with their A Passes.. Next an award was given to Taylor Gilbert. Taylor trains at Stamford, and battles health issues, but she always gives 100% and shows great maturity with how she overcomes and deals with things. Another special achievement award was given to Mark Bain, again Mark is a relatively new student but once again his level of commitment and dedication is 110%, he trains 3 times a week despite his years. His age has made it a litttle more difficult for Mark to achieve the same as his younger counterparts, but Mark does not let this stop him, quite the opposite!! Another award was handed out to Christopher Park, Mr & Mrs Auciello had visited Chris earlier in the day to present him with his award as he was not able to attend the evening event. Chris is a very talented student, who trains with the England squad, and is very widely recognised by all of the Squad coaches. This year Chris travelled to Derby to the ITUK champs and came back victorious! Chris has had a very tough end to the year, but even through these hard times Mr & Mrs Auciello have been astounded by his maturity and outlook! Chris epitomises the tenets of TaeKwon Do, and will be a very successful martial artist in the years to come! The final special achievement award was presented to a very surprised Alex Bland. Alex trains in Oakham and is once again another very dedicated student who trains religiously every week and also additional lessons in Stamford. Alex has always had fantastic technique, perticularly with his legs, and this was proven when Alex attended the British Championships in October. This was Alex's first competition, and he came back with the silver medal, narrowly losing out to Mr Holmes son in the final, depsite taking him to sudden death! A fantastic achievement! Well done to all of these students! The final award of the evening was the highly coveted Student of the Year award. Mr Auciello had thought long and hard on whom to give the award to. This years student trains in Stamford and is a young student at a high grade. This students attitude is first class, he always gives 110%, is polite and listens to all commands. He has always done very well at gradings and it is very obvious that this student loves TaeKwon Do! The student of the year 2012 award was presented to Nathan Naylor, and made his mum cry! With all the awards presented, the disco started again and the karaoke, and there was proof that TaeKwon Do is not all our students are talented at! There was one point where Saturday night was playing and the dance floor was full of just boys!! Mr Liam Watkinson and Mr Steve Marshall led the dancing and showed the kids how to party the night away! Gangnam Stamford 7 Oakham GTUK style is one to be reckoned with, proof is on facebook. CONTACT YOUR CLUB SECRETARY NOW!! Free Programme to all Competitors. Free Parking, Refreshments on the day, After Champs Party! Download your form from the members area. The final coloured belt grading of 2011 took place at our Stamford Dojang on 4th Dec 2011. This was a highly succesful grading with some execellent performances.. Special mention must go to George Tyler and Marcus Francis for A passes.. Results from the grading were announced at the Presentation Night on 10th December at Ryhall Village Hall, together with Student of the Year Award, Special Achievement Awards and Attendance of the Year Award. Congratulations to Emily Reeson who is the Student of the Year 2011; also to Lucy Stockley, Marcus Francis, Liam Watkinson, Jessica Auciello & George Tyler who were presented with Special Achievement Awards and also Imogen Freeborough for Highest Attendance - closely followed by Leon Grant & Emily Cartmell-Wills. Everyone had an amazing night - with a sold out bar and plenty of hog roast..... An excellent way to end the year!! his absence was presented with a special award for his dedication to organising the event and his hard work as head coach of the England Squad.. Flowers were presented to Mrs Auciello to her part in the organisation. Mr & Mrs Auciello are so proud of everyone that attended and gave their all; we have wonderful students who have amazing potential for the future of not just Stamford & Oakham but for English TaeKwon Do! Stamford students joined members of the GTUK England Squad at the opening of a new club for Mr Auciello at Catmose Sports Centre on Sat 1st October. There were spectacular displays of high kicks and patterns of the movements and techniques of the Art as well as special demonstrations of how powerful the techniques can be by Head Coach and Senior GTUK Instructor of the area Mr Auciello breaking 3 kerbing stones and England squad student Alun Haines, from Birmingham breaking a breeze block with a back kick. Rutland Radio breakfast presenter Rob Persani opened the club on Saturday morning by joining in a challenge against England Squad members and also under the Instruction of Mr Auciello broke his first wood with a strike technique. The new club will train on a Saturday mornings at Catmose Sports Centre, where students can benefit from improved confidence, fitness, and discipline in a family friendly environment. TaeKwon Do has been running for over 10 years and is run by former World Champion and GTUK England Squad Head Coach, Mr Richard Auciello. The club has a high achieving history, with Mr Auciellos Instructor, Mr David Mears being a World Champion, Mr Auciello himself a former World Champion, and numerous students from the club who have represented England across the World. The club currently boasts 13 students who train in the England Squad and 3 of those recently represented the England Team in Scotland at the beginning of the year, one being Mr Auciellos daughter Jessica, at a mere age of 9.
student Faye Gilbert in recognition of her perseverance and determination, this award forms part of a Scholarship for her enabling her to attend training twice a week to help her build on her confidence and self-belief!